Custom field type where entity reference is optional? I am trying to create a field type that is a bundle of two fields. An entity reference user field, and a plain text field. The idea is that the user attached to a published piece of content may have a different name at the time of the publication (marriage, divorce, name change, whatever) and has to remain intact for historical reasons. I am still linking to the same user profile, its just the visible name that is different. The most up to date name lives in the user account, but thats irrelevant. 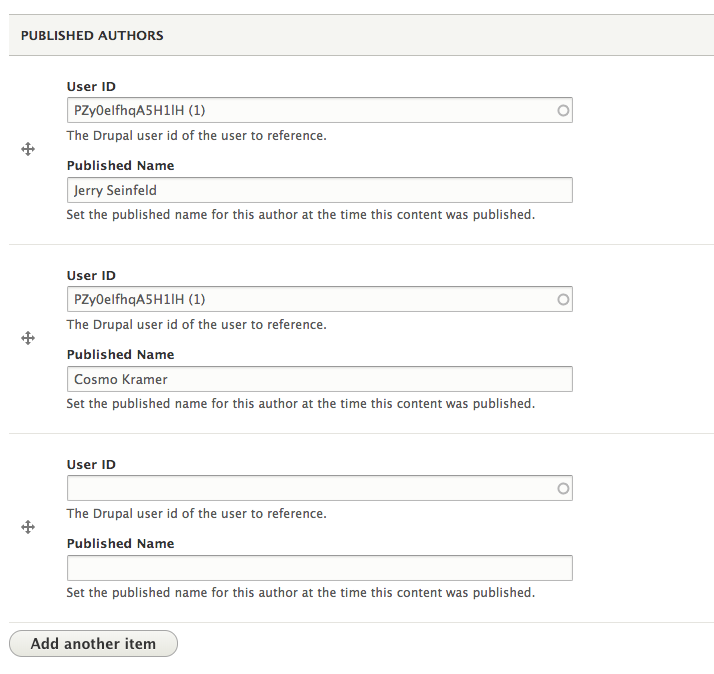 There may be certain cases where a contributing author won't exist as a user in Drupal at all, for a handful of reasons. In this case, I do not want to fill in the reference field, but still use the plain text field. The field formatter will be updated to detect the presence of a target id or not. I can't seem to get it to save an input though unless it has a reference value. How can you do that? * Plugin implementation of the 'authors_widget' widget. edit: Guess I should note that the reason for using the plaintext field here with no user id value is to preserve the listed order of the authors/contributors, which is important with the content we are dealing with.